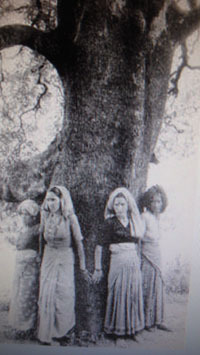 The Chipko movement: A group of peasant women in Reni Village in the state of Uttarakhand, India surround and hold on to trees in their forest to prevent them from being cut down by a lumber company given cutting rights by the government. The confrontation grows out of growing resistance to the commercial logging that is destroying the traditional forests that local people rely on for their livelihoods. On this day, knowing of the villagers’ resistance, the government has used a ruse to lure the men of the village to a distant location so they will be away when the loggers arrive. However, when loggers appear on the scene, the women of the village rush out to confront them. When it seems that logging will begin regardless, the women start hugging the trees to prevent them from being cut down. After a four-day stand-off, the loggers leave. When news of the success of the tactic reaches other villages, a movement of resistance to commercial logging quickly spreads, leading to hundreds of grassroots actions. The tactic is originally known by the Garhwali word “angalwaltha” but becomes more widely known by the Hindi term “Chipko”. Over one million people demonstrate in Spain against the Spanish government’s support of the U.S. invasion of Iraq.